I am always a sucker for a good urban landscape, but it’s almost hard to categorize Alexandra D’Arcy’s paintings as such. 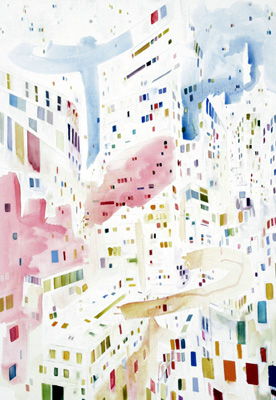 They clearly suggest high rise buildings in clusters, but are also light and colourful experiments in abstraction. One thing they are for sure is enjoyable. Visit Alexandra at booth BLUE 208 this year at the TOAE. This entry was posted on Thursday, June 26th, 2008 at 10:15 am	and is filed under Oils. You can follow any responses to this entry through the RSS 2.0 feed. You can leave a response, or trackback from your own site.